Loving husband, father, grandfather, and brother, Thomas F. Boyd, passed away on Sept. 26, 2018. Tom was born on Aug. 23, 1934, in Cobble Hill, Brooklyn. A devoted family man and a devout Catholic, Tom spent 61 years with his beloved wife, Jane, whom he met in the early 1950s when working at the same company as her, Robin Line. Tom and Jane married in 1957 and built a life in West Brighton, Staten Island , raising four boys and one daughter. Tom joined the New York City Police Department on Nov. 1, 1955, spending 28 years on the force, retiring on Aug. 26, 1983. After retiring from the NYPD, Tom spent approximately 13 years as vice president of corporate security for Merrill Lynch. Tom loved nothing more than spending time with his nine grandchildren watching them at their sporting events and spending time with them on family vacations. “As our family grew over the years it became readily apparent to me that my father had a great capacity to love. From my mom, to my brothers and I, to his loving daughters-in-law, and the “lights of his life” his grandchildren, he showed us the real meaning of family. He absolutely created a wonderful one for all of us,” said Thomas Boyd Jr.
Tom was a member of the Blessed Sacrament Holy Name Society, the NYPD Emerald Society, the Sergeants Benevolent Association, and the NYC Verrazano 10-13 Association. Turning tragedy into hope, Tom served as the president of the Staten Island Chapter of the Leukemia Society after he and Jane lost their daughter, Susan, to leukemia at the age of 4. He also served as the president of the Blessed Sacrament Titan League and was a pioneer in youth sports by starting the girls sports program. Tom is survived by his wife, Jane; his sons, Tom Jr., Bill, Bob, and Tim, and his “daughters,” Barbara, Marlene, Laura, and Christine; his grandchildren, Kevin, Erica, Timmy, Justin, Chris, Emma, Julie, Bryan, and Andrew, and two sisters, Katherine Newman and the late Rosemary Hansen, and several nieces and nephews. 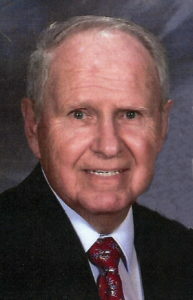 Offer Condolence for the family of Thomas F. Boyd, Sr.